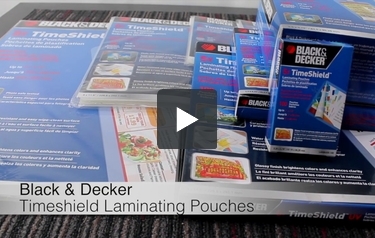 Business Card Size, Laminates Items Up to 2" x 3.5"
Guard all your important information with Black & Decker's easy-to-use Timeshield Thermal Pouch for business cards! These water-resistant laminator pouches for business cards have an easy wipe-clean surface and a 5mm thickness. And make sure to get creative with photos and logos--these are photo-safe! These will literally have you covered. This product comes in a pack of 10 pouches. Make sure you actually have a thermal laminator, since you'll need one to get these done and sealed. These will have a glossy finish that will brighten up all the colors and enhance the clarity of the text and photo. Black & Decker high quality pouches will protect your work while still maintaining a look of professionalism.